The makers of Kalank first released a classical number from the film titled "Ghar More Pardesiya", and now they have released a dhinchak dance number titled "First Class". The song was one of the most-awaited songs until, the goof-up which happened by Karan Johar and which led to the trend, #ShameOnKaranJohar. 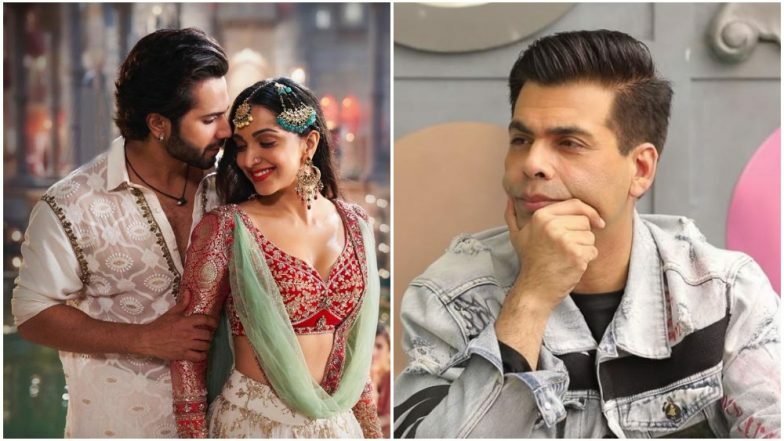 Despite the song been released, fans continue to slam the filmmaker instead of focusing on the “First Class” jodi Varun Dhawan and Kiara Advani. Kalank Song First Class: Varun Dhawan's Swag and His Chemistry With Kiara Advani Are Both First Class! - Watch Video. Karan Johar shared Kalank’s song and captioned it, “SAB #FirstClass HAI!” But we don’t think Twitterati have calmed down yet. When a song is released, we usually see comments (positive/negative) about the song, but here, fans want the song and the film to be boycotted after Karan Johar ended up liking an offensive post on Shah Rukh Khan. But Karan Johar maintained a positive attitude and tweeted, “Aaj twitter pe thodi gadbad ho gayi but baaki sab #firstclass hai.” Karan Johar Blames ‘Technical Problem’ After Accidentally Liking Insulting Tweet About Shah Rukh Khan. For those who don’t know, a screenshot took the internet by storm after which #ShameOnKaranJohar started trending on Twitter. Karan Johar mistakenly ended up liking a post that a netizen posted, abusing Shah Rukh Khan and since then fans of King Khan started slamming the filmmaker. KJo later took to Twitter and cleared the air, but looks like that is really not helping him. KJo tweeted, “Guys having a technical problem with my twitter account! Strange things are going on!from uploading shoe picture and gibberish to liking tweets I haven’t even read and would NEVER even acknowledge! Please bear with me and I apologise for any inconvenience! Sorting it out asap!” #ShameOnKaranJohar Tops the Trends After Karan Johar LIKES an Offensive Tweet on Shah Rukh Khan. Paiso ki power me andha ho gaya hai. Never forget your past it always connected with SRK. Despite Karan Johar trying to explain what happened, looks like fans of Shah Rukh Khan are not ready to buy it. Things are just getting worse for KJo as fans of SRK are highly miffed. Do you think, this ‘strange things’ would affect Kalank? Share your thoughts with us in the comment box below.